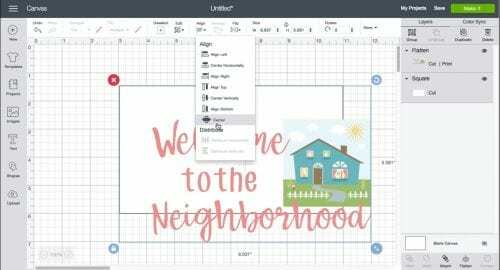 Have you tried the Print then Cut feature in Cricut Design Space? Oh wait, is it print THEN cut, or print AND cut? I guess either way it means the same thing! Whatever you call it, there are so many possibilities of what you can create! 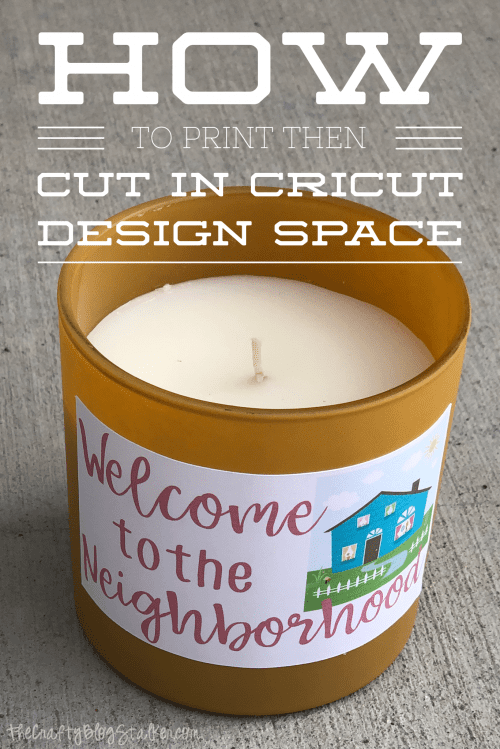 I wanted to make a small welcome gift for a new neighbor, so decided this was the perfect time to share some tips and tricks for Print and Cut! Even if you don’t want to make the same design I am making I’ll share some great tips on how to design your own print then cut! What is Print then Cut? 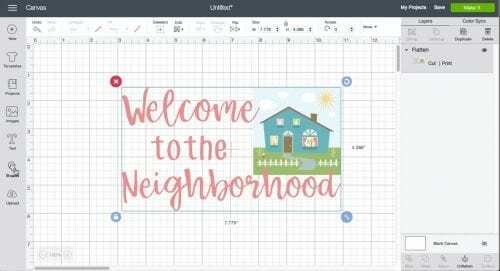 For starters, let’s talk about what the print then cut feature is inside of Cricut Design Space. Print then cut is when you print your image or design on a printer, hence the “print”. Then you run that same printed sheet through your Cricut cutting machine and that image is perfectly cut out. That is where you cut the “cut”. So print then cut is a very appropriate title. 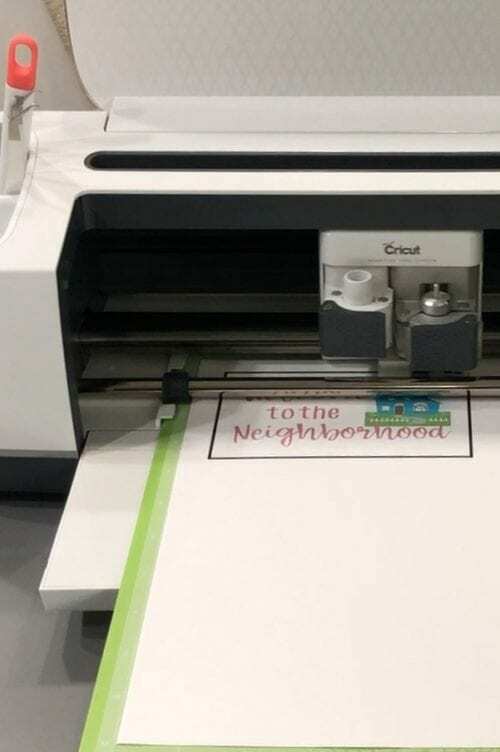 You will print directly from Cricut Design Space so any printer connected to your computer or device should work. I have an older HP Jet printer that is model# 3051A and print then cut works perfectly. 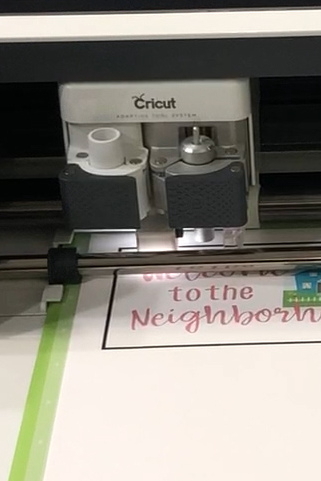 You can also cut your printed design on any Cricut Explore or Maker machine. Today, I will be using my Cricut Maker. 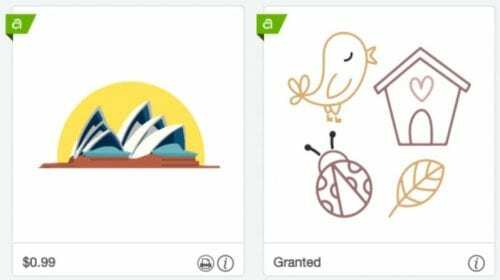 When you are searching for files in Cricut Design Space there are two different ways to identify the type of file you are looking at. Now all files inside Cricut Design Space are cut files so that is a given, but some are print then cut files. Those can be identified with the little printer icon in the bottom right-hand corner of the image. Can you spot it in the image below? Images with the small printer icon are print then cut ready! BUT you can change most cut files into print then cut too, it just takes a couple extra steps. 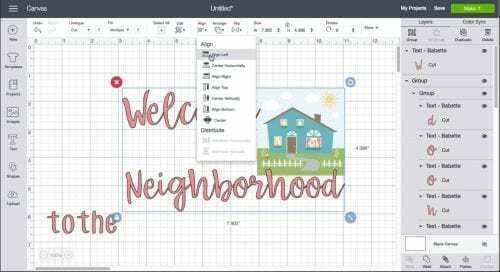 When you are in the canvas creating your design in Cricut design space, you will see a small menu bar where you can slice, weld, attach, flatten, and contour your design. When you click Flatten, it takes all of your layers and combines them into one. 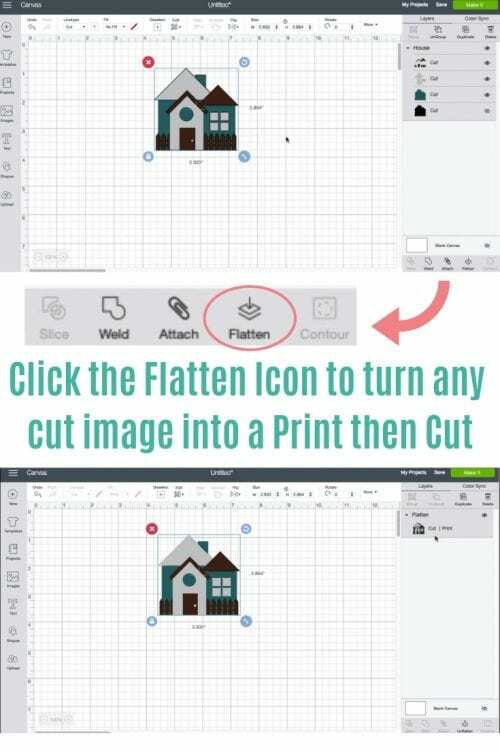 Flatten makes it so you can print your image as a whole instead of cutting each layer out separately and piecing together the different layers to complete your image. It’s easy peasy! The smallest you can go for a Print then Cut is about 1/4″ square, and the largest you can go is 9.25″ x 6.75″. But don’t worry, if your printable image is too large you will get a warning message telling you to reduce the size. Now, let’s make something fun with the Print then Cut feature! I designed this project so I could give a small personalized gift to our new neighbor. But, I will be sharing tips and tricks that can be applied to any-type of design that you want to create. 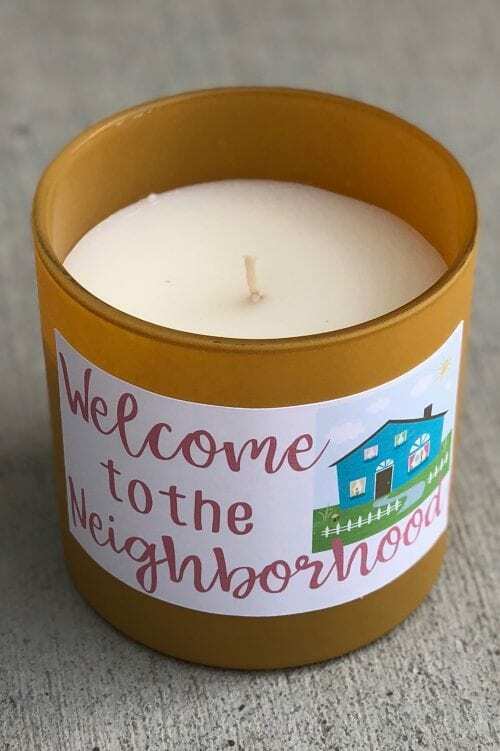 Supplies Used for Neighbor Gift Candle: Some links may be too similar items when exact items couldn’t be found online. 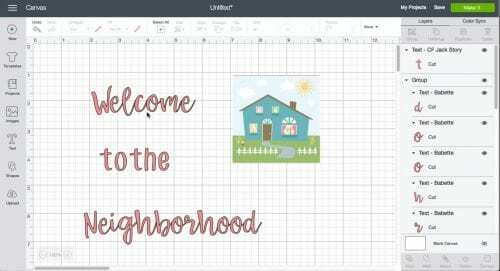 In Cricut Design Space click on New Project, this will take you to a blank canvas. Search for the type image you want to use. I searched for “house”. 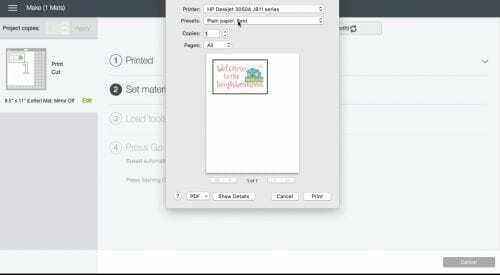 If you want a print and cut ready file you can filter your search result and only search in printables. Select and highlight the image(s) that you want to use and click on insert images. This will bring those images into your canvas. Add your text to your design. I used two different fonts. Babbette and CF Jack Story. Since you are printing the design, make sure to change any colors of text that you want a specific color. I changed my text to pink so it would match the curtains in my house image. Right now the text is showing as a cut file, and that is ok. We will will flatten everything when we are done arranging and that convert all of the files into one layer making it a print then cut. Cricut Design Space has an awesome feature for aligning so you don’t have to eyeball and guess for perfect placement! For this design, I started at the bottom and worked my way up. 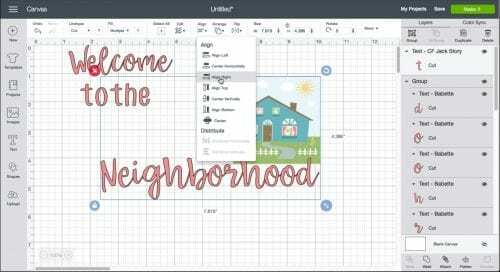 Space the text “neighborhood” beneath the image with the spacing that you want. Then select the neighborhood text and image and select “Align” then “Align Right”. This will align the end of the text exactly with the edge of the image. Once aligned, click group to group these two sections together. That way you can move them around but they will stay perfectly spaced. Next, we are going to align the welcome text. Highlight “welcome” and the grouped image and select “Align” then “Align Left” and then “Align Top”. This will align the text to the beginning of the neighborhood text and the top of the image. Once aligned, make sure to group again. 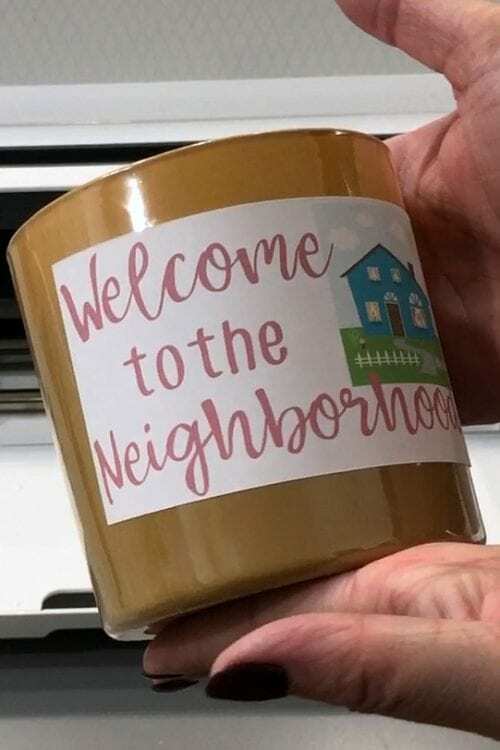 Since the “to the” text isn’t perfectly centered in the middle of the design, we will need to eyeball the placement between “welcome” and “neighborhood”. Again, make sure to group all of the pieces together. Now that we have all of the pieces aligned, click the Flatten icon to convert everything to one layer. We are close to done, but not quite there. 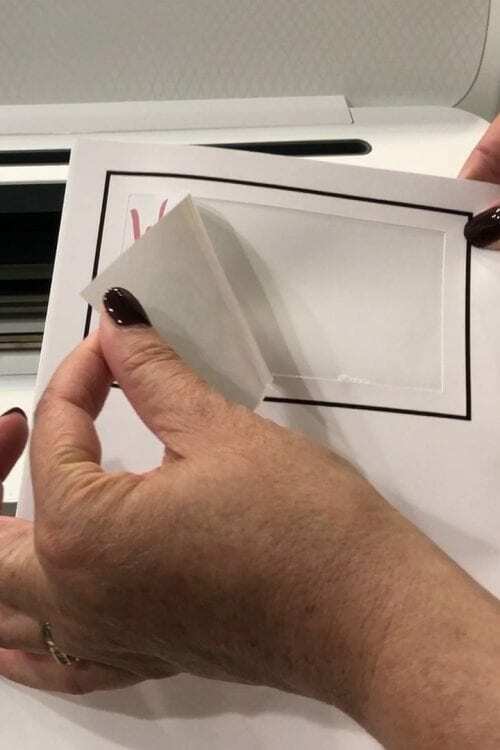 We need to give the image a backing, otherwise, when we cut the image the Cricut is going to cut around each letter making it so all of the pieces are no longer connected. Add a square from the Shapes menu and size around the designed image, and change the color to white. Then use the Align tool again. Highlight the white square and the grouped image and select “Align” then “Align Center”. This will align the image to the center of the square. Now that the design is complete check your measurements and adjust as needed. Click on “Make It”. This will take you to the next step of printing out your project on your home printer. We are taken to a preview of what the printable should look like once it is printed and laying on a cutting mat. Click “Continue”, then “Send to Printer”. 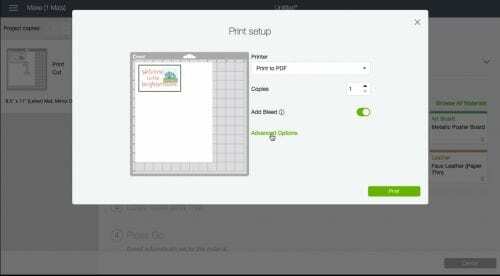 A Print Setup window opens and you can select how you want to print. I like to choose “Advanced Options” which takes me to my printer’s window so I can check my options there. I make sure the best printer quality is set and click on print. 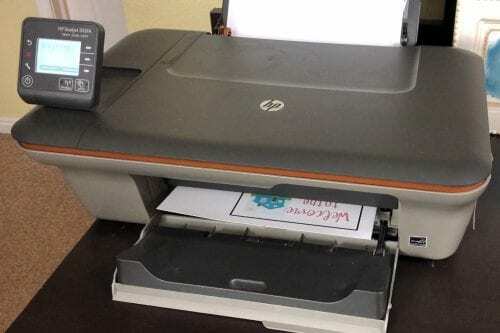 My printer is an HP DeskJet #3050A. It is really old (doesn’t even have bluetooth) but it still works perfectly! Now that the design is printed all that is left is letting the Cricut Maker work it’s magic and perfectly cut out the design! 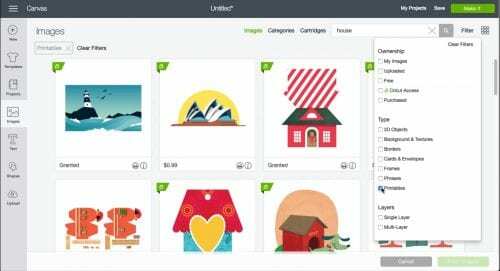 In Cricut Design Space select the type of material you are cutting. 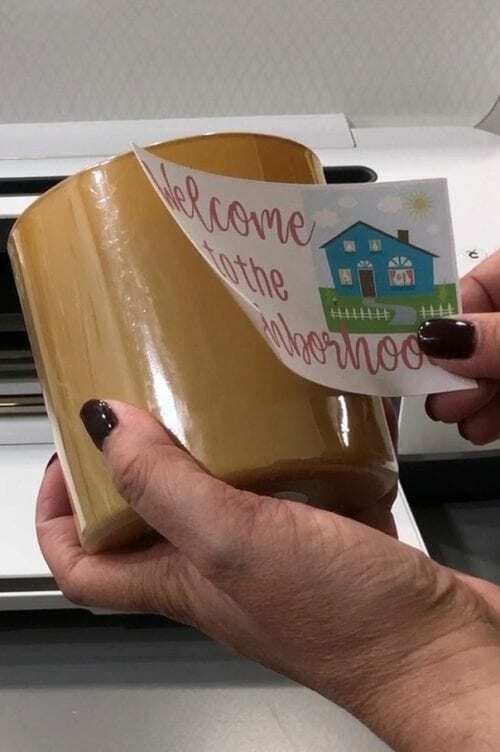 I am using Cricut Printable Sticker paper. Align the printed sticker sheet onto the green Standard Cutting Mat and follow the prompts. Once loaded, you will see a little light come on near the blade. This is the Cricut looking for the black frame that printed around your design. That frame tells the Cricut machine exactly where to cut. Once the machine knows exactly what to do, the blade moves to the right of the machine calibrates and then begins cutting. The new sticker peels easily away from the backing sheet. Place the sticker on the candle. Now I know this may seem like a lot of steps. But I wanted to make sure you know exactly what you need to do. If you feel like I missed a step or have a question about something, I suggest watching the video above. Sometimes it is easier to talk about something naturally then to break it down into step by step. But if you have any questions, don’t hesitate to ask in the comment section below. You can also use this cut file if you would like. Overall, this project from start to finish took me about 20 minutes to complete. So this really is a quick and easy project! 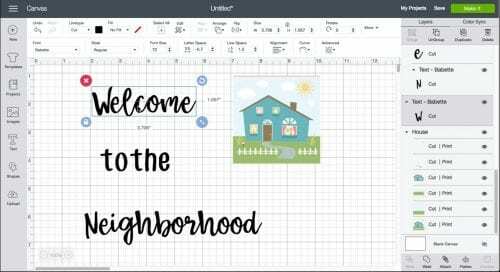 Click here to get your own Cricut Maker! What design would you create for Print then Cut? Share and leave a comment below!